We have all witnessed the SegWit war, haven’t we? If you were part of the cryptosphere in 2017, you must have heard of the Bitcoin SegWit update. If you were not, here is the backstory. The Bitcoin scaling debate reached its climax in June 2017 when it was agreed that in the following July, Bitcoin will be soft-forked or upgraded to the SegWit version to satisfy demands. And following Bitcoin’s suit, many altcoins have also embraced SegWit because they all understand that it is the right thing to do. Many have followed Bitcoin because these altcoins are ultimately forks of Bitcoin, so they also needed to embrace that solution to combat future scaling problems. Also, SegWit fixed a popularly known bug in Bitcoin and other forks of Bitcoin i.e. Transaction Malleability. In short, many altcoins have now implemented SegWit as it also opens the doors for further off-chain scaling solutions such as Lightning Networks. SegWit has many other benefits too, as elucidated here. 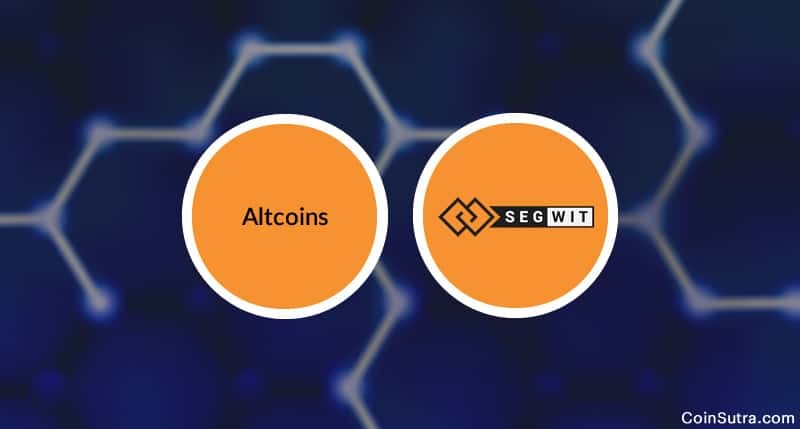 And in this article, we are going to discuss some notable altcoins that have activated SegWit on their blockchain. Litecoin is silver to Bitcoin’s gold. We all know that, but have you thought why Litecoin (LTC) was created? Well, it was created as a backup in case something went wrong with Bitcoin. But so far, Bitcoin and Litecoin are doing pretty well and surprisingly LTC is serving as a testbed for Bitcoin. During the SegWit update also it was Litecoin that implemented SegWit first on its blockchain. It was implemented by Bitcoin only later. In this case, too, Litecoin served as a testing ground for Bitcoin. Later, Litecoin’s lead developer also conducted atomic swaps between BTC and LTC to further solidify the path for scaling. Vertcoin was created in 2014 with a focus on creating a peer to peer cryptocurrency that is decentralized. Hence, mining algorithms that were chosen to implement it were unusable with ASICs, making Vertcoin available for mass mining in a decentralized manner. After Litecoin, Vertcoin followed the suit to become the next SegWit activated cryptocurrency and started testing for it. Finally, Vertcoin implemented SegWit on May 7, 2017, to enjoy benefits such as faster transactions and reduced fees on its network. Check out the new SegWit address format coming to Vertcoin! Digibyte, famously dubbed as a sleeping giant by its community, had also activated SegWit in 2017. It achieved the feat even before Vertcoin. The Digibyte project was founded in 2014 with an aim to make a decentralized cryptocurrency built for the digital age which was secure and swift as well. Digitbyte has 5 mining algorithms implemented in the software to achieve proof of work which makes it quite decentralized. Digibyte also implemented SegWit after much deliberation and consensus from its community in April 2017. Nav Coin is one of my favorite altcoins. It is an anonymous cryptocurrency that is privacy-centric proof of stake coin with dual blockchain. The project has been functional since 2014 based on Bitcoin’s core code. Given that Nav Coin also uses the UTXO model like Bitcoin, it also has transaction malleability problem. To fix it, Nav Coin implemented SegWit on its blockchain, post which SegWit was implemented on Nav Coin making it the first POS coin to implement SegWit on its blockchain. Syscoin is another crypto project that started in March 2014 with an aim of becoming a decentralized eBay. It is not quite clear whether it has achieved that feat thus far, but one thing is clear that it is being rapidly developed to create a decentralized marketplace. Also, it implemented SegWit to fix the transaction malleability considering it is a fork of the Bitcoin protocol. It became successful in implementing SegWit in the first quarter of 2017 around the same period when Litecoin implemented SegWit. It is natural that many coins implemented SegWit following the example of Bitcoin and Litecoin because all these altcoins had forked from Bitcoin at one point or the other. That’s why they all carried flaws that were intrinsic to Bitcoin’s blockchain. But in reality, they didn’t need to update their blockchains to SegWit because they were not facing scaling issues that Bitcoin was. By doing so, they have set themselves up for future debates that might rage when their blockchain hits a scaling hiccup. That’s all from my side in this article. I hope these insights help you stay on top of the crypto game. What is “HODL” in the Cryptocurrency World?